If you own an import, and it acts up at one point or the other, it pays to know what some of the probable causes for the misdemeanour are, and these probable causes are sometimes preventable through tropicalisation. It beats sense, therefore, to assume that everything I mention as possibly going wrong will actually go wrong. Smoking analogyThe best analogy I can come up with is smoking. Smoking has some wide-ranging adverse effects on the human body. Some smokers get away with mere chest infections, others develop cancer, others die. Yet others will live to be 100 before they are killed by a gang of robbers. The same could be said of cars: some imported vehicles will work almost faultlessly, others will suffer minor niggles, while some will fail completely. How this happens depends heavily on how and where you use your car. I know of an individual who imported a Subaru Legacy GT Spec B from Japan, and while on his way to Bulawayo from Durban port, his engine gave up the ghost ' completely ' at Mtito Andei. He had not even got home yet. He had not even registered his car! That aside, it is important to ask whether or not the second-hand car market is still relevant, or whether it has outlived its usefulness. This sector of the economy came about in the last decade, when the economy was liberalised and trade tariffs adjusted to allow the importation of used cars, mostly from Asia. Afforded dreamsThis liberalisation opened a floodgate of otherwise unreachable cars onto our shores, and afforded the middle-class their dream and ambition of motor vehicle ownership without necessarily being either of Asian origin or having friends in the ruling regime. To control the flow and prevent the flogging of overused hardware, I think a cap need to be placed on the age of vehicles coming in: anything older than say five years is supposed to be a no-no. This, however, will not prevent some sneaky individuals from getting older stuff in, but that is a story for another day. With the economic madness of the last decade and the dollarisation of the economy, cars are now suddenly affordable. For a lot less than what it once cost, one could get oneself a reasonably sound set of wheels, where "reasonably sound" in Zimbabwe means a car that starts within five attempts and can still move slightly further than the gate without grinding to a halt. 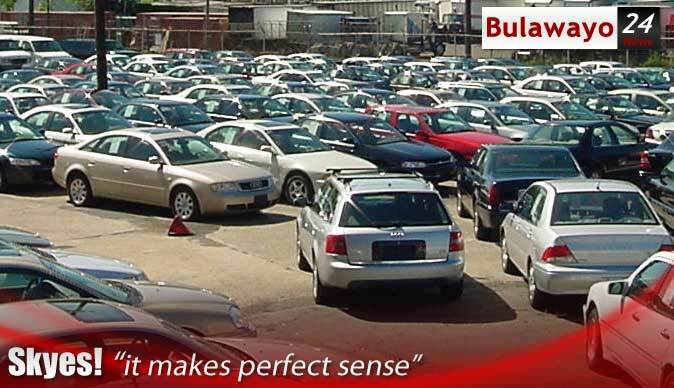 The local franchises experienced a massive drop in sales and a whole new industry was created in the seedier parts of Bulawayo and some major towns as spare parts came in to support the incoming cars. A few short years later, annual registrations doubled, then tripled, then quadrupled the number plates changed in 2005 to accommodate more and more. The second-hand reconditioned cars also made some people very rich because these things cost a mere pittance at the source. It looks like the second-hand cars were a boon to the economy and to society. More people could now afford a car, while some entrepreneurs got rich and everybody seemed happy. Really? Not so. The first to be disgruntled were the local franchise holders. After years of overcharging clients, suddenly those clients had an alternative, and an affordable one at that. Business went through the floor, and to keep their heads above water, it was necessary to make some noise. The government was asked to shut down the grey channel to rescue those floundering operations. Imported cars were chastised as being unfit for our conditions and being "other people's leavings". If the Japanese were discarding those cars under the notion that they were no longer fit for operation, who were we to take them? Don't we have standards of our own? The buyers were not too far behind. People found out that 'yer gets what yer pays for', and whatever costs peanuts is most likely peanuts. These vehicles' life spans are ridiculously short, and the cars themselves are delicate and prone to mechanical gremlins. However, they cost next to nothing, so their ephemeral nature is the payoff. Toyota and Nissan (x-Japs) beckoned: on the one hand were the overpriced, and thus unaffordable, locally assembled or tropicalised units, on the other were the cheap but flimsy used alternatives. It was up to the customers to decide whether to shell out their hard earned shillings for quality material, or to go cheap and damn the consequences. Knowing Zimbabweans, most prefer to save their money. Big garages joined the noisemaking bandwagon when their business also floundered: the spare parts industry greatly boosted the Motor industry, where parts were cheap and the mechanics cheaper, robbing those garages of new clients and some existing ones jumping ship to save money on repairs. So, is the grey market still necessary? It once created hope for the middle-class, but now it seems to have degenerated into a bit of a mess. To start with, there are too many cars on the roads now, which, statistically speaking, account for the increase in traffic accidents. More cars, more accidents; simple. Build Zimbabwe, buy Zimbabwean, someone once said. Local franchises are "seeing dust" as they find themselves with empty parlours and nobody darkening their doorways since the exact same hardware they are selling can be had from Singapore or Japan for fewer shekels. Toyota and Nissan, especially, seem hugely popular on the importation front, seeing as they cost ten figures here while externally sourced units cost a few dollars. A website I visited at the behest of a friend offered me a four-year old BMW 735i limo for a mere $4000. At Zimoco, or wherever it is they sell BMWs nowadays, that car cost an arm and a leg. At four years of age, the price may drop to slightly below $2500. Even with freight and import duty added to my cyber-BM, I doubt if the total cost would come anywhere near $7000. Not even the passenger transport sector is immune: nowadays several companies operating buses to the have rear-engined vehicles, imported whole from Asia. As I said, the problem with untropicalised cars is unreliability and undependability. Much as it creates new business for spare parts sellers and mechanics, it is still costing us a lot to keep them running. And creating the new business also has its own unique set of problems as poorly trained mechanics jump into the fray in the hope of "breadwinning" without wielding a crude weapon, and sub-standard spares entering the market to keep up with the demand. I may be wrong, but there must be something illegal about those "half" cars that I see sold in some auto shops. Surely, a car that has been in an accident bad enough to warrant that kind of transplant is a write-off, is it not? It is not safe to reassemble the car's superstructure outside factory settings. There could be a middle ground that will pacify most. What if the franchises were to sell the second hand import cars alongside brand new stock? They definitely have an advantage because they have facilities to support certain models. Zimbabweans love new registrations, so the imported cars could be registered as new ones too. Buying a car from a yard is a gamble. After paying for it, if it refuses to work, you are on your own, the seller won't help. It was working when you bought it, he might reason, so now that it is off my hands, don't bother me. The prices also need to go up, which means the age limit should be lowered further, to maybe two - three years. This will control the number of "new" cars being bought, and thus limit new registrations and keep the number of cars on the road at a manageable level. It will also ensure that better quality cars (younger ones) are the ones being imported, and not somebody else's junk.